With a lot of friends sticking around Portland for April vacation, I've got at least one of the days covered. Brunswick is at the top of our list for a fun morning or afternoon of adventure, with a fabulous art museum, good lunch spots, and of course gelato from our favorite Gelato Fiasco. Bowdoin College Museum of Art in Brunswick has one of the oldest college art collections in the country. Built in 1894 by the renowned architect Charles Follen McKim (of McKim, Mead and White fame), the Renaissance style building is on the National Register of Historic Places. Renovations in 2007 added some interior and mechanical upgrades, along with a stunning glass entry pavilion. Admission to the museum is free, so you can come and go without feeling like you need to cover everything from the Pre-Columbian sculptures to the paintings of Picasso. Our first stop is usually the gift shop to pick up a few postcards for a game of I-Spy. The galleries can sometimes be overwhelming so it helps to give the little C&Gs a goal. If your kiddos are fans of the Percy Jackson/Last Olympian book series they might be interested in the Gods and Demigods found in the works of the Ancient Mediterranean collection. The new exhibit "Sense of Scale, Measure by Color: Art, Science, and Mathematics of Planet Earth" looks like something my kiddos would be super interested in, with vibrant and colorful photos of rocks, minerals, and landscapes from around the world. My favorite funky Mexican place, El Camino, is unfortunately not open for lunch. But they do have a great little place for pizza a short walk from the museum. Flipside makes their delicious pizzas with local and organic ingredients, and they have various combinations available by the slice. I always tell them not to heat up our slices, otherwise it's another twenty minutes of blowing on their pizza before the little C&Gs can eat. 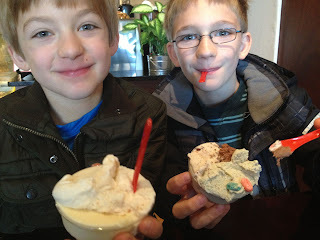 Across the street from Flipside is our favorite spot for gelato. Gelato Fiasco in Brunswick is a little bigger than the one in Portland. There are more tables to sit and hang out, but no little window in the back to watch the magic being made. On the next block is Frosty's Donuts if you're looking to branch out (or you're in Brunswick in time for breakfast). We've never been but rumor has it they're delicious and they disappear quickly. Work off all that sugar with a stroll around the Bowdoin campus where there are plenty of open green spaces for the kiddos to run around. Challenge them with a bear hunt and see how many of the Bowdoin polar bear mascots they can spot. We found our way into the sports center and watched the student athletes hard at work in their beautiful new gym. The gelato calories miraculously melted away just from watching them on the workout equipment. 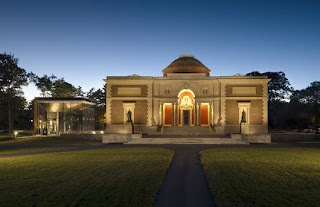 The Bowdoin College Museum of Art is located at 245 Maine Street, right in downtown Brunswick. Admission is always free and they're open Tuesday through Saturday 10:00 to 5:00 and Sunday 1:00 to 5:00.